Planning visiting to the Valley of Flowers From Haridwar then we have best Day wise Itinerary which is gives to easiest way to reach valley of flowers national park uttrakhand. 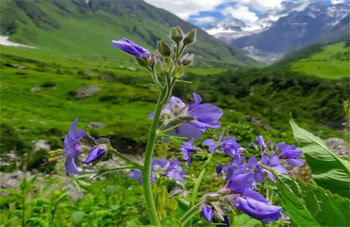 In the below Itinerary, Valley of Flowers Package From Haridwar you can find Best Cost and get Trekking to the Valley of Flowers From Haridwar. In Addition get top quality accomodation and transport for 4 Nights and 5 Days. Day 01: Haridwar - Govindghat (295kms/10-12hr) Height: 3133 MTS. Pick from Haridwar Railway and drive to Govindghat Via Rudraprayag .En route visit Visit on the way Narsingh Temple in Joshimath Check into the hotel arrival in Govindghat. Overnight stay at Govindghat. Joshimath is situated on the slopes above the confluence of the rivers Alaknanda and Dhauliganga. Of the four 'Maths' established by Adi Shankaracharya, Joshimath is the winter seat of Badrinath. The idol is brought down to Joshimath and installed in the temple for people to worship. There are many other temples in the township. The most important is the temple of Nir Singh with the idol of Lord Vishnu. The left arm of this deity is getting destroyed with time and the popular belief holds that the day the arm completely withers Badrinath valley will cease to exist and the Gods will transfer the residence into the neighboring Niti Valley at Bhavishya Badri. Devprayag is one of the Panch Prayag (five confluences) of Alaknanda River and Bhagirathi ( Ganga) River. Rudraprayag is one of the Panch Prayag (five confluences) of Alaknanda River. It is confluence of rivers Alaknanda and Mandakini. Kedarnath, a Hindu holy town is located 86 km from Rudraprayag. Rudraprayag Weather - Generally hot in summer, the temperature ranges from 35-40 degree Celsius, Winter: The Days are pleasantly cool but the nights are cold, temp ranges from 20 deg to 05 deg. Day 2: Govindghat - Ghangharia (10 kms by trek) Height: 3049 MTS. Morning after breakfast, check-out from the hotel & Drive to Pulna Village (Govindghat), starting point for trek to Ghangharia via GovindGhat. On arrival, start the trek of 10 Kms passing through mesmerizing scenic beauty across the white-water river called Laxman Ganga. The trek will take around 6-7 Hrs to reach Ghangharia (Altitude-10000 Feet). On arrival, dinner & overnight stay in Ghangharia. Day 3: Ghangaria - Valley of flower - Ghangaria Height: 3352 MTS. Early morning trek to Valley Of Flower(world heritage sight). Rise and get ready with your breakfast by 7 in the morning. This day will refill your memories with some lasting views of the dream land. Filled with pure beauty and bliss of the nature, this trek will let you witness the solace of nature without the hustle bustle of urban life. The trek carries a distance of about 13-14 kms and it took around 7-8 hrs by trek to cover it. 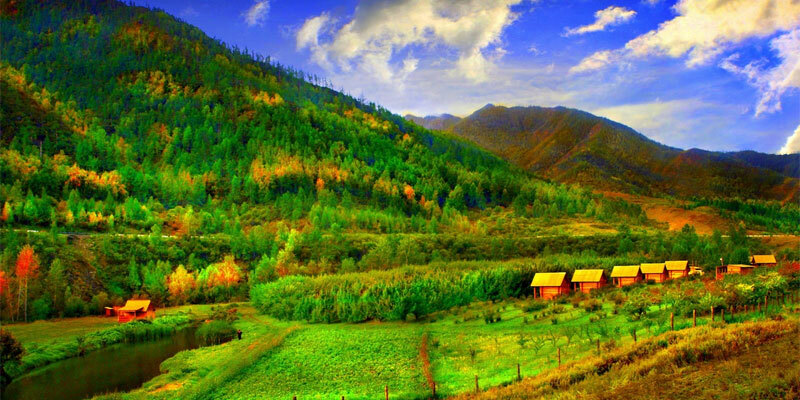 A ticket is issued at the entry gate of the valley that will costs you very minimal amount for the epitome of captivating scenery, you are about to view inside. The ticket remains valid for 3 days. Enter the valley and you will hear the mesmerizing sounds of the birds chirping and flowing water. The unblemished natural beauty offered at this trek will take you to different world free from the adversities of life. If you want to make this trek more enjoyable and memorable, quickly wind up your time and reach the Pushpavati river bed that carries the splendid scene, which is almost hard to miss. The river bed is landed at a distance of around 6 km from Ghangaria. Enjoy the impeccable experience and collect the picturesque memories for lifetime. Day 4: Ghangaria - Valley of flower - Govidghat (10 Kms Trek (aprox4 hrs)+ 29 Kms/1hr) Height: 895 MTS. Wake up early and get ready with your breakfast in the morning. This day will reenergize your memories with some lasting views of the dream land. Filled with pure beauty and bliss of the nature, this trek will let you witness the solace of nature without the hustle bustle of urban life. Latter Trek down to Govindghat,meet our driver and transfer to Hotel overnight stay at Govindghat. Day 5: Govindghat - Haridwar (295 Kms/10-12hr) Height: 895 MTS. Early Morning breakfast, transfer to haridwar via Rishikesh. Rishikesh 'place of sages' is a celebrated spiritual town on the bank of Ganga and is surrounded by Shivalik range of the Himalayas on three sides. It is said that when Raibhya Rishi did hard penances, God appeared by the name of " Hrishikesh " and this area hence firth came to be known as Rishikesh. Later visit Rishikesh Temples & Sight Seeing – Laxman Jhulla, Ram Jhulla. Drop at Haridwar. Rishikesh: Named after the Lord Vishnu, Rishikesh is a holy city for Hindus. Located in the foothills of the Himalaya in northern India it is also known as the yoga center of the world and is home to many world renowned ashrams. Rishikesh styles itself as the ‘Yoga Capital of the World’, with masses of ashrams and all kinds of yoga and meditation classes. The fast-flowing Ganges is surrounded by forested hills inside the city. Apart from temples and ashrams Rishikesh is now a popular white-water rafting centre, backpacker hang-out, and gateway to treks in the Himalaya.